Now, owing to the perps’ and victims’ skin tones, some commentators are to going dismiss this as yet another case of “white-on-white” crime, implying that the problem is internal to that ethnic community, and doesn’t concern broader society as a whole. And they do have a point — most white-collar crime is committed by whites, who dominate the population in minimum-security prisons (like William Head Penitentiary near Victoria, a.k.a Club Fed, which features a six-hole golf course). Having seen the stats, I’m sold! 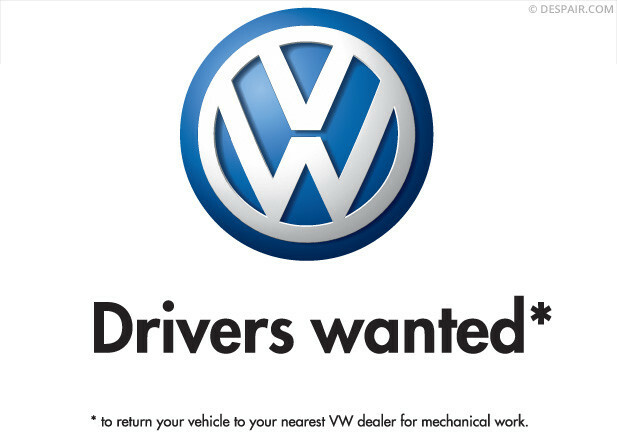 And with the VW scandal, the time is right to expand this proven program to white, white-collar criminals. A “Wall Street Stop-and-Frisk” (as outlined by The Daily Show a couple years back) would allow officers to approach individuals who choose to emulate white-collar criminals’ preferred attire — a tailored suit and tie — and pat them down. Electronic communications play central roles in most such crime nowadays, so their devices (laptops, smartphones) could be temporarily confiscated under pre-existing civil forfeiture laws until the proper paperwork is filed for their return. 1. quality of legal representation would no longer make the difference between someone being found innocent or guilty. 2. legal aid funding would probably reach sustainable levels (we don’t even have the right to an attorney, here in Canada). 3. white collar criminals would think very carefully before deciding whether to commit crimes, knowing they’ll be playing Russian roulette any time they need a criminal lawyer. As it stands today (in the U.S. at least, though similar issues surely carry over in Canada) public defenders are so overloaded (in one part of the US, they spent an average of as little as seven minutes with a client before trial) they convince 90% of their clients to plea bargain; to admit to having committed a lesser crime, in return for lesser punishment. Private lawyers almost never advise doing so. This means the likelihood of your getting a criminal record after an arrest depends more on your bank balance than the prosecution’s evidence. And that’s hardly the kind of society most societies aspire to be. That said, it’s tough to imagine diesel-car buyers deciding en masse to go electric. More plausible, I think, would be VW, BMW and Mercedes ramping up their EV/FCEV offerings (and especially their related marketing efforts) in the next few years — to try to put the scandal behind them. Tesla stands to benefit, since three of its biggest luxury vehicle competitors’ brands have gone mildly radioactive — but probably only modestly, since the auto sector is a strange duck. Laptops and smartphones, and even household appliances, are relatively inexpensive, more-or-less one-size-fits-all items, so it’s not *that* difficult for an individual product to grab a big chunk of the market. Cars are far more expensive, and people in different countries and communities have very different needs relating to family size, hobbies, commuting distances and roads. As a result, the best-selling car in the world (the Toyota Corolla) has about 1% global market share, and the top three companies only split about 30% share between them.